I'd like to make an important point very clear from the beginning – this web site is run by a single individual. I am no corporate entity with hundreds of writers and editors churning out content nor is this web site a full-time occupation for me. I have a day job and I have a life. In the spare time I have, I try to share everything I've ever learned about digital SLR cameras with others. That's pretty much why the Digital SLR Guide exists. My name is Chris Roberts and I'm the writer, editor, graphic designer and photographer here at the Digital SLR Guide. 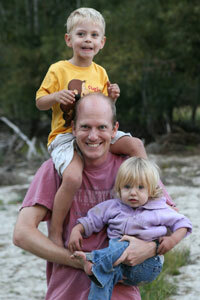 That's me with my kids on the right during a trip to Yosemite National Park. They've grown a LOT since then. To say that I'm passionate about these cameras is a bit of an understatement: I've been writing about them every single day in some way or another since late 2005. Back then, I really could not call myself a digital SLR expert. The cameras that were available were insanely expensive and they weren't really used by non-professional photographers. I had used a DSLR – a Canon 20D – to take pictures on my own and I had spent a lot of quality time figuring out what each and every button and setting allowed me to do. I also spent a great deal of time reading about which new camera models were just around the corner. This was just before the start of the digital SLR "revolution". All of a sudden, the digital SLR was no longer exclusively for professionals. Once the price of a camera body with lens dropped below $1,000 USD a race developed between the different manufacturers to see who could capture the attention of the average "armchair" photographer. At the same time, a knowledge gap developed. Professional photographers who were steeped in SLR film terminology had little trouble figuring out how to work a digital SLR. Yes, they had to learn a small amount of digital jargon but the learning curve wasn't steep. But when the DSLR became available to the masses, a lot of non-pro photographers became curious about these cameras due to their advanced speed and superior image quality. 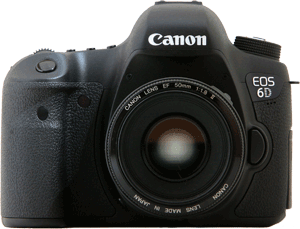 Between 2006 and 2007 there were plenty of web sites that provided information about DSLR cameras, but they were all aimed at the pro and semi-pro readers. There didn't seem to be many sites breaking down the complex features of the DSLR into easy-to-understand bits. The Digital SLR Guide as you now see it is designed and written solely for beginning photographers or intermediate photographers using a DSLR for the first time. Put another way, the guiding principle that I use when writing all the content for this web site is "keep it simple". To be honest, I'm much more practical than analytical and when I use any new DSLR I'm not really interested in how well it takes pictures of color charts or whether it offers a custom menu setting for "indoor action photos under fluorescent lights". Instead I try as much as I can to identify weaknesses or strengths based on common everyday use. I'm not a professional photographer by any means. My most common subjects are my children, my yellow Labrador and whatever spectacular scenery I happen to catch while on vacation. In short, I try to use cameras the way I expect most readers of this web site would: to capture important events in my life so that years from now I can look back and fondly remember all that happened. I hope that by now you have a better sense of why the Digital SLR Guide exists and who it is intended for. This brings us to an important question: why should you listen to me? The short answer is this: you shouldn't. Instead, you should use the Digital SLR Guide as helpful tool when looking for a new camera or lens. But in the end, the final decision should be up to you. Having said this, I do have a lot of hands-on camera experience that I can leverage each time I pick up a new DSLR. To date I have used over a dozen digital SLR cameras from Canon, Nikon, Pentax, Olympus, Sony and even the late Konica Minolta. I don't have any established bias or preference for any camera maker. Having used them all, I see where some excel and some could use improvement. Even the mighty Canon has slipped up from time to time and I've been honest in my reviews when they have. I hope that you leave this web site with the same passion and enthusiasm that I have, not only for DSLR cameras, but also for photography in general. Photography is a never-ending hobby: there is always some new skill to learn or some new technology to master. This is what has kept me engaged with the Digital SLR Guide for all these years. I never stop learning. Another thing that has kept me engaged and moving ahead - even on those days when I vow that I can't read or write another word about a digital SLR camera - is YOU, the reader. I have received so much positive feedback over the years and I am constantly surprised and amazed at how people leverage the information that I provide - not only to find a decent camera - but also to discover a new hobby that they love. Thank you for reading, and may all your photos turn out great! No, this site doesn't run on yard clippings or Red Bull (although that WOULD be interesting if it did). Instead, I am able to share my passion and hobby with you without going broke thanks to the partnerships that I have established with several online camera retailers. When visitors to this web site purchase their cameras, lenses and other accessories from one of these retailers, I receive a small percentage of the sale. This in turn allows me to rent and/or purchase new digital SLRs when they come out so I can review them. For example, I am a participant in the Amazon Services LLC Associates Program, an affiliate advertising program designed to provide a means for sites to earn advertising fees by advertising and linking to amazon.com. The other two companies that I have partnered with are the places where I buy all of my digital SLR gear: Adorama.com and B&H Photo and Video. Both companies have physical locations in New York, but provide exceptional prices and customer service via their web sites. Please understand that you are NOT obligated to buy anything from these retailers - I provide the links to them because I've found that they offer the best prices on camera gear and I want to give you the opportunity to compare online prices with your local camera store.